Saturday 17th October brought a workshop via The Melbourne Art Festival (that's Melbourne - Derbyshire, not Melbourne Australia). The festival itself is fantastic - with an Art Trail that encompasses several historic buildings and a [collective noun here] of interesting local artists. 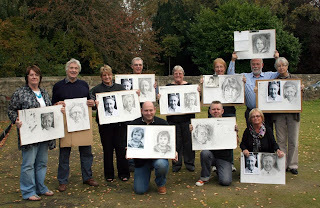 I put together a workshop looking at breathing life into pencil portrait drawings. Having worked extensively from both life and photos - I know the latter can easily lead to static, stale and one dimensional images. So the one day cohort worked on strategies to reduce the chance of making a tired flat image - and produce something with a bit of, well... ooomph. I had a wicked time and met some really nice people AND some good work 'done got made'!!! Everyone, myself included, staggered out knackered and covered in graphite - which is a sure sign of a day well spent. Keen local observers might recognise a face or two. Local Art Teaching Legend Roger Charles kindly lent his mug to the proceedings as a fine example of photo source material with a broad range of tonal value. Rog - I'm assured, used daily, Oil of Olay can dramatically reduce broad ranges of facial tonal value. If you're interested in workshops - contact Melbourne Festival, who'll probably have a mailing list.